polarityinplay..! 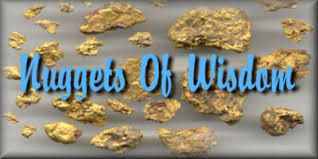 : Charlie P's Nuggets of Wisdom! a new identity that is not new..
CC - I found this in reviewing my keeper files created 4 years ago. Some of these 25 messages seem to resonate quite well with some of your blogs and some of the subjects we've been kicking about rather recently. And some are ancient wisdom. 1. We are all One. All things are One Thing. There is only One Thing, and all things are part of the One Thing there is. This means that you are Divine. You are not your body, you are not your mind, and you are not your soul. You are the unique combination of all three, which comprises the Totality Of You. You are an individuation of Divinity; an expression of God on Earth. 2. There’s enough. It is not necessary to compete for, much less fight over, your resources. All you have to do is share. 3. There's nothing you have to do. There is much you will do, but nothing you are required to do. God wants nothing, demands nothing, commands nothing. 4. God talks to everyone, all the time. The question is not: To whom does God talk? The question is: Who listens? 5. There are Three Basic Principles of Life: Functionality, Adaptability, and Sustainability. 6. There is no such thing as Right and Wrong, there is only What Works and What Does Not Work, given what it is you are trying to do. 7. In the spiritual sense, there are no victims and no villains in the world, although in the human sense it appears that there surely are. Yet because you are Divine, everything that happens ultimately benefits you. 8. No one does anything inappropriate, given their model of the world. 9. There is no such place as hell, and eternal damnation does not exist. 10. Death does not exist. What you call “death” is merely a process of Re-Identification. 11. There is no such thing as Space and Time, there is only Here and Now. 12. Love is all there is. 13. You are the creator of your own reality, using the Three Tools of Creation: Thought, Word, and Action. 14. Your life has nothing to do with you. It is about everyone whose life you touch and how you touch it. 15. The purpose of your life is to re-create yourself anew in the next grandest version of the greatest vision ever you held about Who You Are. 16. The moment you declare anything, everything unlike it will come into the space. This is the Law of Opposites, producing a contextual field within which that which you wish to express may be experienced. 17. There is no such thing as Absolute Truth. All truth is subjective. Within this framework there are five levels of truth telling: Tell your truth to yourself about yourself; Tell your truth to yourself about another; Tell your truth about yourself to another; Tell your truth about another to another; Tell your truth to everyone about everything. 18. The human race lives within a precise set of illusions. The Ten Illusions of Humans are Need Exists, Failure Exists, Disunity Exists, Insufficiency Exists, Requirement Exists, Judgment Exists, Condemnation Exists, Conditionality Exists, Superiority Exists, and Ignorance Exists. These illusions are meant to serve humanity, but it must learn how to use them. 19. The Three Core Concepts of Holistic Living are Honesty, Awareness, and Responsibility. Live according to these precepts and self-anger will disappear from your life. 20. Life functions within a Be-Do-Have paradigm. Most people have this backward, imagining that first one must “have” things in order to “do” things, thus to “be” what they wish to be. Reversing this process is the fastest way to experience mastery in living. 21. There are Three Levels of Awareness: Hope, Faith and Knowing. Spiritual mastery is about living from the third level. 22. There are Five Fallacies about God that create crisis, violence, killing, and war. First, the idea that God needs something. Second, the idea that God can fail to get what He needs. Third, the idea that God has separated you from Him because you have not given Him what He needs. Fourth, the idea that God still needs what He needs so badly that God now requires you, from your separated position, to give it to Him. Fifth, the idea that God will destroy you if you do not meet His requirements. 23. There are also Five Fallacies about Life that likewise create crisis, violence, killing, and war. First, the idea that human beings are separate from each other. Second, the idea that there is not enough of what human beings need to be happy. Third, the idea that in order to get the stuff of which there is not enough, human beings must compete with each other. Fourth, the idea that some human beings are better than other human beings. Fifth, the idea that it is appropriate for human beings to resolve severe differences created by all the other fallacies by killing each other. • Permit yourself to acknowledge that some of your old beliefs about God and about Life are no longer working. • Explore the possibility that there is something you do not fully understand about God and about Life, the understanding of which would change everything. • Announce that you are willing for new understandings of God and Life to now be brought forth, understandings that could produce a new way of life on this planet. • Courageously examine these new understandings and, if they align with your personal inner truth and knowing, enlarge your belief system to include them. • Express your life as a demonstration of your highest beliefs, rather than as a denial of them.